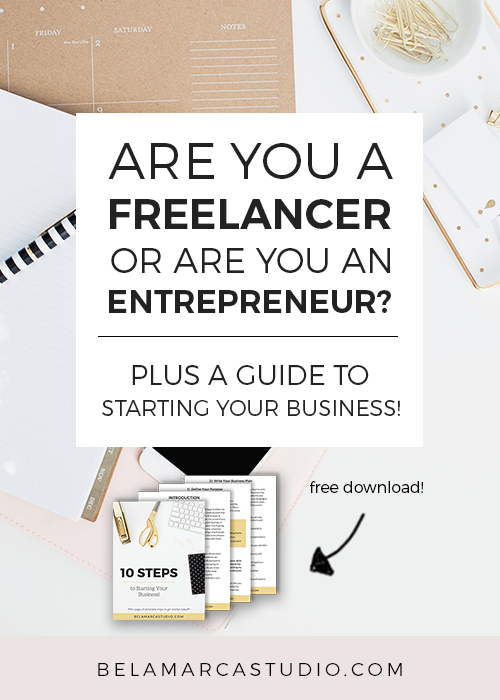 Are you a Freelancer or an Entrepreneur? When people first started catching wind about my design business, they would often say: “So I heard that you freelance on the side…?” To which I’d quickly say: “Well yes, I have a business…” I don’t know why but for some reason, I’d get a slight awkward feeling inside because to me, the word freelance didn’t cut it. I felt like my business was more than just a side thing (and oh did I want it to be more than just a side thing! ), I felt like it was a small machine, that with love and care would turn into this money-making powerhouse. When I started my career, I was a freelancer. To me that meant that I would let people know here and there that I was available to do some graphic design work on the side, if they wanted, and to just let me know when. I didn’t market, or invest in a lot of tools, or create any content besides work I was hired for. I’m sure thIs is gonna be hard for you to believe but (#sarcasm), I didn’t make much money--AT ALL. So when I finally started my business (actively making money, supporting other businesses, and supporting the life I love) I knew that this time it would be different. HOW ARE THE TWO DEFINED? A freelancer is a person who is self-employed and isn’t necessarily committed to a one specific employer for a long period of time. They may work on a contract basis for a number of companies, as opposed to working as an employee for one company. Nearly any job out there can be done by a hired freelancer, whether it’s from web design to bookkeeping, or copywriting to tech support. Either way, it’s a flexible way to bring in cash at your desired price point. An entrepreneur is person that runs a small business, often innovating new ideas and services, and assuming all the financial risks that may come along with said venture. They typically think of a problem troubling their target audience, create a product to solve said problem, and then market the product which brings in customers. Often times they create a business plan, hire employees, and acquire financing. An entrepreneur may bootstrap (meaning to start a company with little capital, from personal funds or from money solely made from the company), or they may sway towards using venture capital, acquiring investors to help jumpstart their business. In this PDF guide, learn the exact 10 steps needed to get your business off the ground! **Plus a list of tools to keep your business running itself! Awesome! Now check your email to confirm and download the PDF guide! I knew when I asked what the difference is between a freelancer and an entrepreneur (if any at all) that I’d learn a whole lot more about my peers and how they view the work being done in this industry. I found that the two are more similar than they seem--still with some unique differences. The answers mainly fell into 3 categories: Independence, Cash Flow, and Scalability. Independence. A freelancer is oftentimes a “solo” effort; a one-man show working for someone else and working on the other person’s terms. When you hear freelancer, you may think more of a free spirit, kind of like “if it happens, it happens.” They typically offer a service in real-time. An entrepreneur typically tries to go beyond the solo level. They run all aspects of their business and typically call the shots. They offer services, products, and are more likely to build a team of players to help them accomplish their business goals. Oftentimes it’s entrepreneurs that hire freelancers. But payroll doesn’t always come cheap. Cash Flow. Freelancers trade time for money. The work is for the paycheck and they typically have to be involved in all aspects of the job. For instance, a designer may only make money when they work on client projects and then get paid. If said designer takes a 2 week vacation, they make no money during that period of time. An entrepreneur has created a business that is independent from him and brings in revenue even when he isn’t actively working in the business. This takes a lot of work up front. An entrepreneur has positioned himself or herself to have the choice to be actively involved or not because they have built a system that doesn’t require their constant attention in order to function. Scalability. A freelancer works a lot of “gigs” or “jobs”. Some one at a time and some several at a time. They are small business owners at best with one employee. They are good with reaching out and making connects. However, sometimes when working for a company, that company is oftentimes the middle man between the freelancer and the real client, with which the freelancer may not have contact with to expand their network in the end. When an entrepreneur builds a team, they are able to enhance and scale at a faster rate because of the additional hands and versatile skills that they’ve added to the business. Instead of a job to make ends meet, an entrepreneur is often in the mindset of building multiple businesses and perhaps eventually selling them. Many industries, especially the creative industry, would not be able to function without freelancers and the skills they have. Job Responsibilities. An entrepreneur wears many hats. They can be a freelancer and a content creator, for example. They network, market their services, do their own bookkeeping and pay taxes, launch products and courses, maintain their websites, network with prospective clients and more. Whether you’re a freelancer or an entrepreneur, you may not get paid holidays, or insurance through your job, or sick days. The sacrifices made and the work that goes into it isn’t just for quick cash but is a piece of the puzzle in the entrepreneurial venture. At the end of the day, we have those who run their own businesses, and are paid to create content for others. Entrepreneurs who freelance. Many industries, especially the creative industry, would not be able to function without freelancers and the skills they have. “Self-employed” is a large umbrella term that hosts different avenues. Honestly, if you cater to your clients, handle your business affairs, and bring in revenue, you’re a small business owner and congrats to all of you that are doing just that. Wanna start a business but don't know how? What do you think? Are freelancers and entrepreneurs the same? How can our community show more respect for each role? I help new business owners learn how to be design-saavy and attract their ideal clients. When you learn more, you're worth more.